After exploring Kagoshima, we arrived at Kumamoto with the bullet trains. We dropped off our luggage at our lovely hostel (which I will write about in a different post) and went exploring what this city had to offer. We walked around the famous Kumamoto castle, which we properly visited on another day, but also encountered near it, an area in which samurais used to live in. The style of the houses suggested just that- except now, the houses were restaurants... an interesting mix but it definitely created a neat atmosphere! 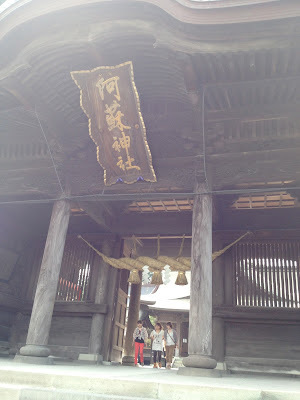 The next day, we took several trains and a bus eastwards from Kumamoto, to go to Mt. Aso, the largest active volcano existing in Japan. On the way, we saw beautiful shades of greens with a gorgeous sky- it makes me realize the fact that the forest covers almost 70% of Japan. Being in the city and a big one at that, in Tokyo, you tend to forget that, but a step out, a few hours (maybe not even) you find incredible sights like this. Once up at Mt.Aso, we had the option of walking to the crater or taking a rope-way. Being stingy but mostly because we liked to hike and enjoy the view as well, we decided to walk up the little 20 minutes path. We had the luxery of having this wonderful view all to ourselves! As we got closer to the crater, we could also feel the temperature getting hotter- special to feel this difference with our own bodies, and really feeling that we were on an active volcano. Once up we could take a walk around the crater, and it was really quite interesting seeing bits and pieces and cross-sections of the mountains. Seeing the layers made me start to imagine the different periods it had gone through... and really how little part of its history us humans have been part of. And the smoke coming out from it! Made it all real to us that it was an active, living volcano. After the impressive volcano experience, we decided to explore the nearby Aso area. 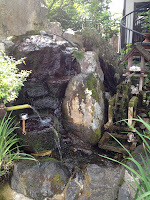 Right next to the shrine was also a path of springs. Just walking along this street, we saw many many kinds of natural spring water just running, and people walking around empty pet-bottles to taste them. We even saw a few people coming up with a car filled with tanks, which they filled them with their favorite spring water. After a looooong day of volcanoes, waters and shrine we were ready to go back to Kumamoto. Visiting local public baths had around this time become a routine of ours. It just felt nicer taking a long bath instead of a just a shower tiny spaces of the hostel- where we could talk about the day's events and plan some of the following days. In Kumamoto the hostel owner recommended to us this cozy one called Kiku no Yu, meaning Bath of the Chrysanthemum. Super retro and old, it felt like we traveled back time when we entered the building. The unforgettable thing about this place was the old lady running it. Sitting in a comfy looking couch in the middle by the door (the place is divided by a wall for men's and women's baths respectively but she sits in the middle to handle the money), she'd sit and watch TV, but not in a regular way. The TV was placed on the wall behind her, so she had placed a mirror in front of her, a little bit above her eye level, and this way she could see the TV through the mirror. She'd then comment, laugh, bang on the table as she watched the programs. Of course the TV show was fun too, but Sara and I could not help but to watch the old lady and be entertained. Places become what they are to one sometimes, precisely because of an interesting character. 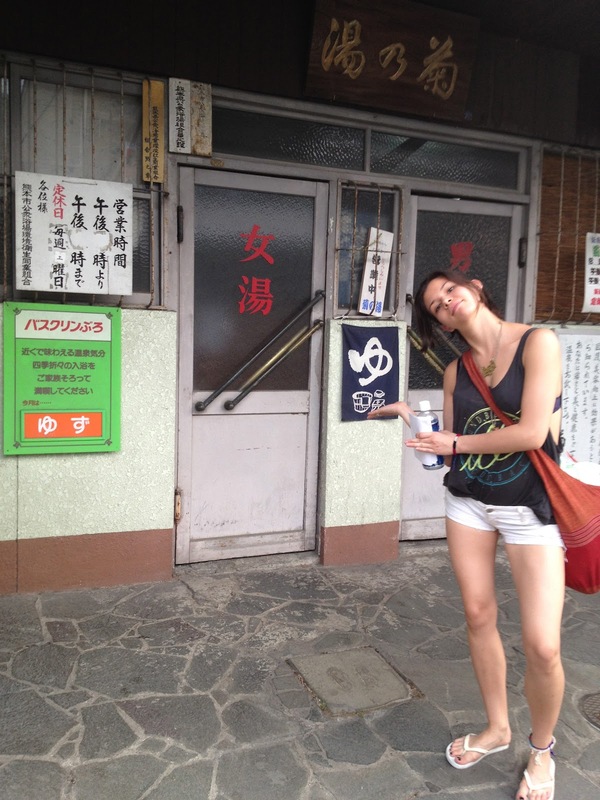 In the case of Bath of Chrysanthemum, this lady was essential in our public bath experience. I hope that she is well even today, laughing to one of her favorite TV shows.